Recently I bought the Moonlight Slumber Little Dreamer Dual Firmness All Foam Crib Mattress after weeks of researching about various crib mattresses. Today I am giving a honest review about this crib mattress. I buy several baby mattresses so as to test myself and recommend the best ones to my readers. This mattress is little costly,but it was affordable.I did a lot of initial research for a mattress that would suit my little one’s crib. Although I did fancy a number of other mattresses, I finally chose this one because it met all my criteria and it was cheaper than those organic crib mattresses. I was quite happy with my choice. This affordable mattress comes with a sleeping surface that is guarded on both sides. Therefore, this sort of a safety net for my kid was a great addition. The core of the mattress is so soft that my little one nestled and made herself very comfortable. In fact, I decided to lie down on it the first night and was impressed with how soft it was. From the first look, you will know that Little Dreamer mattresses are different. The mattress comes with a simple shape and is quite compact. Once you add sheets to it, it really looks snug. The Moonlight Slumber is a reputed brand that specialises in creating the best possible crib mattresses with top quality eco-friendly materials and made in the United States out of medical grade foam.Foam mattresses are advisable if you need a lightweight crib mattress. When it comes to the functional part of the crib mattress,it is provided with dual sided densities which is an excellent feature. It comes with dual firmness like the Safety 1st Transition Crib Mattress which I had reviewed before.This mattress comes with side stitching which cannot be seen in standard construction. 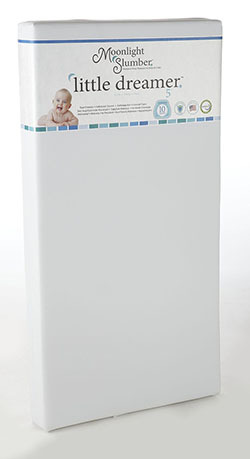 This product is created by Moonlight Slumber using no harmful chemicals and completely with high quality eco-friendly materials.This baby crib mattress comes with CertiPUR certification and is free from vinyl,polyethylene,PVC,phthalates and lead.Also this is a hypoallergenic foam crib mattress that comes with a lifetime warranty against manufacturing defects.What else you need to make sure that this is a highly safe crib mattress for your kids? 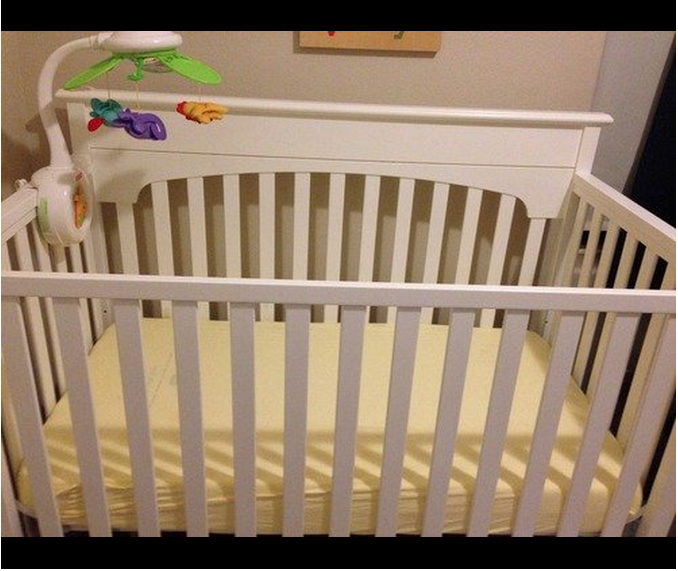 This mattress is compatible with all the standard sized cribs and there was no issues regarding this.You can make sure by double checking your crib dimensions with the mattress dimensions before you buy. We use it in our Babyletto Hudson crib and it is a perfect snug fit. I am so glad that this mattress is waterproof. I say that because my toddler is always spilling juice when drinking from her sippy cup during the day. However, I just had to use a wet wipe to get the stain off. However, I would recommend giving the mattress a good dusting and a wipe down every week. No matter how well a mattress is made, it is still prone to bed bus and dust. Also, since my child has sensitive skin, I take extra precaution by dusting it every day. It does have safety features that will give you a sigh of relief because my child’s safety is of the utmost importance. Costly - But it's worth your money!! This is surely a great buy for people looking for the best foam crib mattress with dual firmness at a 'Value for Money' price tag. It really is soft and is sleep-inducing . When considering all those different aspects of a foam crib mattress,I can say that this is the best foam crib mattress available currently. Once you purchase,you will never get disappointed. If you take a look at Amazon you’ll find many other customers have great things to say about this crib mattress model. And if the price is a little over your budget, I would advise you the next best crib mattress: Safety 1st Transitions Baby and Toddler Crib Mattress.